This outfit was completely inspired by my necklace, probably my most favorite necklace I have in my collection. It was quite the splurge when I originally bought it from Stella and Dot, but I bet my price per wear is next to nothing right now. I wish it were still available so you guys can benefit from its awesomeness, and I can never find anything that even remotely looks like it as an option to buy. This is the last of the four Barcelona camis I purchased a couple weeks ago. (I also have it in lace, snakeskin, and a shiny black.) I guarantee you will see it one other time in the near future because it's reversible! It's teal colored on the other side. As I was debating on which color/side I wanted to wear today, I realized this necklace would be perfect regardless. 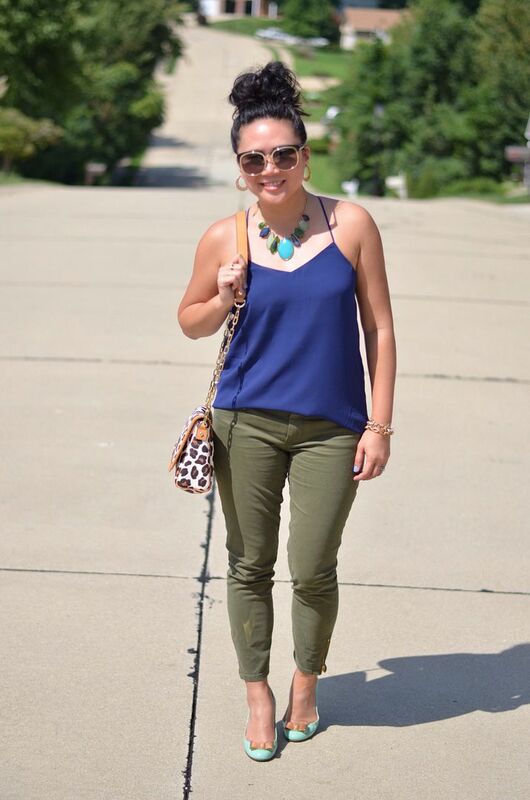 And the the olive skinnies (last seen here) and mint shoes fell into place pretty quickly. I honestly would not have thought to piece this outfit together had I not known the colors already worked because of this necklace. If I look terrified in these photos, I promise I am not. I am just trying to cover up how hot I am and how much my clothes are sticking to me. But I must say, I'm loving my hair! It had been curled, and I put it up in a high pony, spun it into a bun shape, but instead of using bobby pins to secure it, I used another hair tie over it to keep it in place. Then I started pulling and tugging to loosen it up and give it more height and randomness. I've seen videos of others do this, but I've never actually tried this myself until now. When I just needed my hair off my back and didn't want to spend too much time on it. Literally took one minute. I just love big hair, don't you? Before I go - Elle and Jacqueline are featuring one of my looks today - so be sure to link up with them and check me out here! 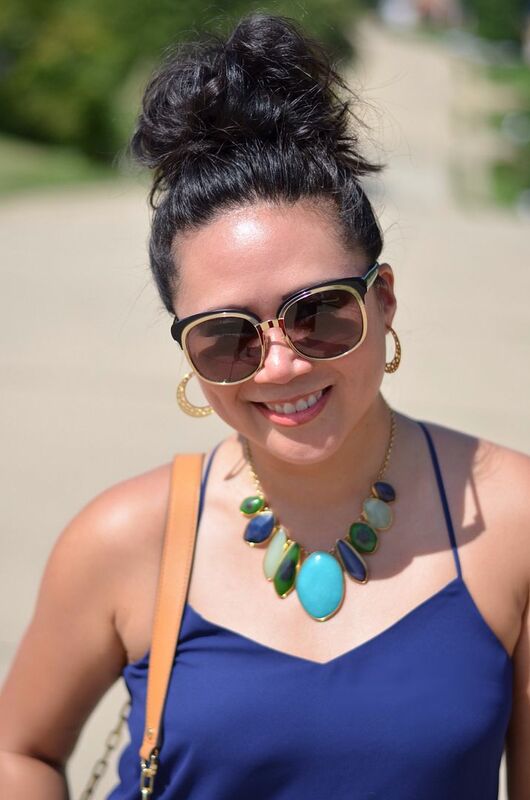 Linking up for: Tres Chic, Summer Style, Working Girl with Style, Spotlight Weekly Linkup with Elle and Jacqueline. 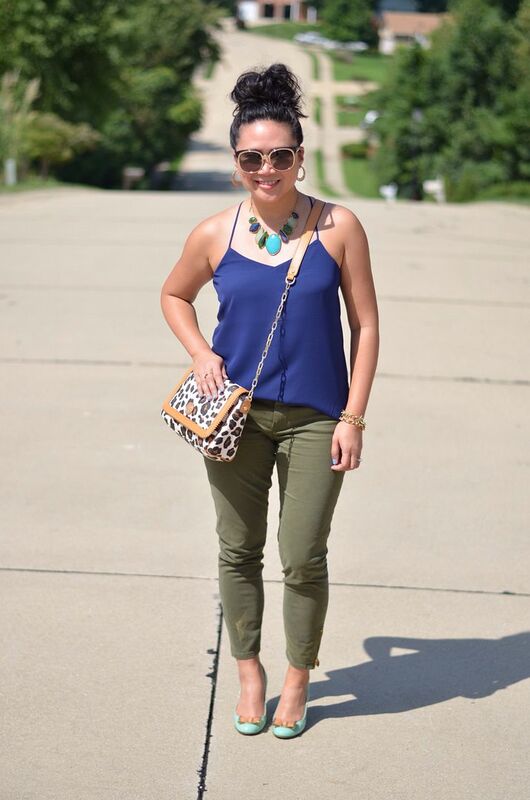 I love the color combo here and I am on the hunt for olive jeans, if you see any let me know. Just at Old Navy but the rockstars honestly don't work for my body. I shall keep my eyes open for ya!! 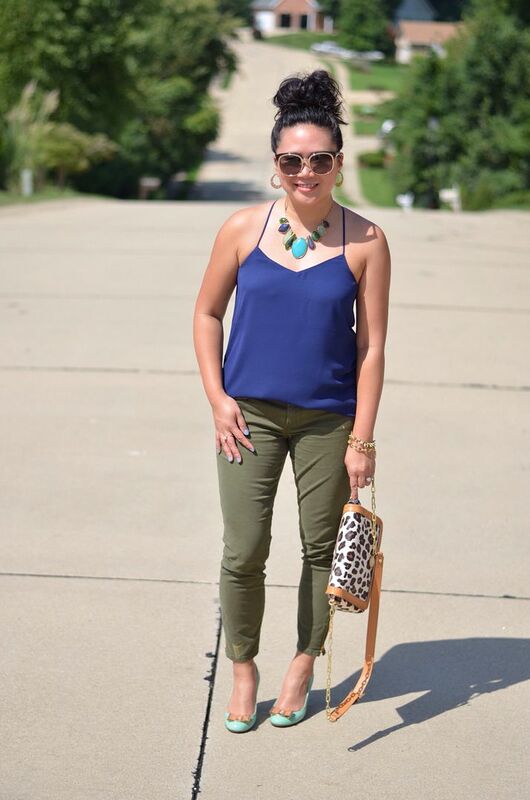 These colors do blend really well and I love how you worked around your necklace to create this look. So clever. :) I think I may be in over my head with blue Barcelonas. We will see when the mailman gets here this week, plus the one more I may have picked up online during the sale...yet I want ALL THE COLORS!!! Hahahah!!! I expect a family photo of all the Barcelonas when you get them! They are great staples tho! Especially for your climate! Love this! So chic and adding dark green pants was perfect!! Thank you so much! I'm loving it! Yes, a two for one is the best. Best cami ever. Sad I waited so long to buy them! There was a news anchor in Florida that wore this necklace a lot and I always admired it. I love when I get inspiration for color in unexpected places. These pieces do work together quite well. It really is a great necklace. I couldn't resist it and I'm glad I took the plunge because I've gotten so much use out of it! 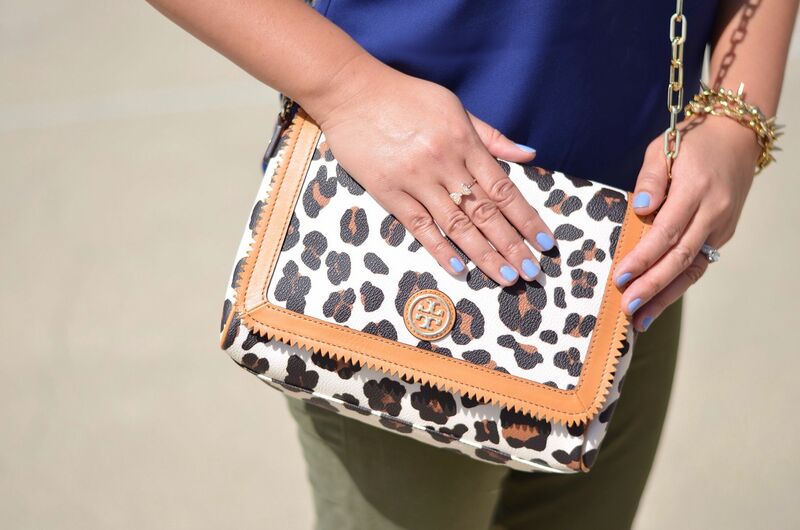 that tory bag is perfection! love the cute print on it! looking fab, love your outfit! Great look! These colors will go great into fall! I love that bun! Looks great on you! Thanks so much! And it's kinda my new favorite hair style for the moment! I love the mint shoes with the cobalt!! Such a pretty color combo - LOVE! Cobalt and mint is one of the best combos ever! Love how cute your bun looks! And the pairing of olive and blue is so pretty! Thanks, so much! I really never would have paired these two tougher before! But I love it! Lovely top and heels colour combo! Thanks so much! They coordinate nicely together!